Roger Federer has given us so much – thrilling wins, poignant losses, and now in addition to all his triumphs and all his tears, tennis’ grand ambassador is giving us an actual event. He and his Team8 team have created the Laver Cup. The Ryder Cup-style competition between Europe and the rest of the world will take place September 22-24 in Prague. Team Europe, featuring Federer, Rafa Nadal, Marin Cilic, Dominic Thiem, Alexander Zverev and Tomas Berdych takes on Team World – a squad that will have no shortage of appealing stars: Nick Kyrgios, US Open hero Juan Martin del Potro and Canada’s breakout heartthrob Denis Shapovalov, as well as America’s top stars Sam Querrey, John Isner and Jack Sock. Here are six things you should know. The Best Doubles Team of All-Time? Magic and Bird playing together on the Lakers? Mays and Mantle both on the Giants? Messi and Ronaldo on Barcelona? Sorry John McEnroe and Peter Fleming, sorry Woodies and sorry to the Bryan brothers, fans will soon see tennis’ version of a doubles dream team when Federer and Nadal step onto the doubles court together. Between them they “only” have 35 Grand Slams titles, 448 weeks at No. 1, 186 total titles and four Olympic medals. The two have faced each other 37 times and, of course, give us delightfully contrasting styles. Nadal’s brute muscularity, hefty grunts and two-fisted backhand will be juxtaposed with Federer’s quiet elegance and one-hander. For the first time we know of, two of the greatest players of all-time are joining forces. Another focus of the Laver Cup is the renewal of one of tennis’ greatest rivalries. When John McEnroe and Bjorn Borg met on the court forty years ago, they drew world attention and sent the game to new heights. McEnroe captains Team World in its underdog quest to defeat Team Europe, coached by Borg. Borg and McEnroe took different paths during their careers and afterward. While Mac has remained public and active, Borg has been more enigmatic. 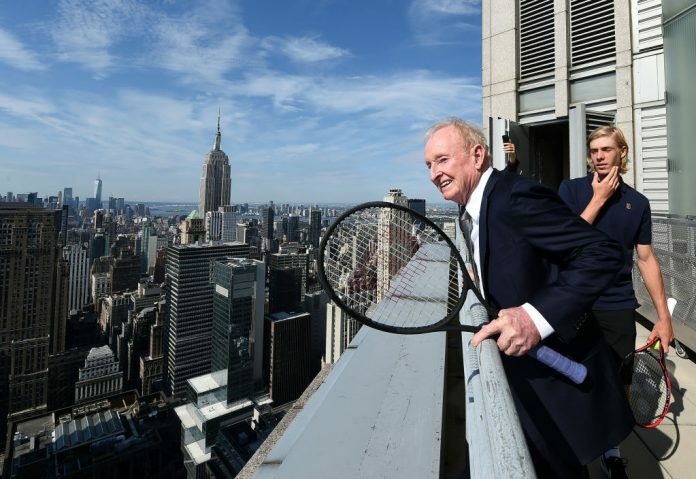 The Laver Cup adds a new chapter to their Hall of Fame rivalry. BTW: Some say the Euro squad to be the best team ever. Led by Roger, Rafa and Cilic, it’s said to even outdo the ’95 US Davis Cup team that featured Pete Sampras, Andre Agassi and Jim Courier. The chief focus of the Laver Cup is on the Greatest Generation, led by Roger and Rafa. But the much-heralded Next Gen players will also make some noise. Alexander Zverev and Denis Shapovalov are in Prague with the hope of proving that they belong among the top players in the world. Both young stars have had breakout years. Zverev, 20, has climbed all the way to No. 4 in the world and he won two Masters titles. Shapovalov, 18, had a stunning summer, defeating Nadal, del Potro and Jo-Wilfred Tsonga. And Nick Kyrgios, 22, is said to be tennis’ most compelling “tortured artist” since his captain, McEnroe. McEnroe coaching Kyrgios could be a happening. The Laver Cup takes place only a week after the Davis Cup semis. This is meant to contrast the two team events. The Laver Cup will attempt to retain the boisterous team atmosphere of the Davis Cup, while condensing it into one weekend of great tennis a year. Some have said that the mere existence of the Laver Cup has played a role in the Davis Cup making a number of recent changes, and if the Laver Cup is a winner, look for the Davis Cup to initiate even more updates. Roger Federer is honoring his childhood idol by christening his new event after him. From one GOAT to another, they are clearly celebrating the lineage of champions. By naming the tournament after Laver, Federer pays an extraordinary tribute to his idol, formally enshrining the Rocket’s name for all to see. Click here for Laver Cup broadcast info. ESPN International and The Tennis Channel will broadcast the event in the Americas.